Alconleigh is my new design for the Knits for a Cold Climate collection a collaboration with Susan Crawford and Karie Westermann for the Susan Crawford Vintage label. Following on the heels of Nancy, Clemmie, Asthall and Noblesse Oblige, the collection is really coming together and there are still more exciting new designs in the works. When discussing Knits for a Cold Climate with Susan I knew I wanted to design a hat. 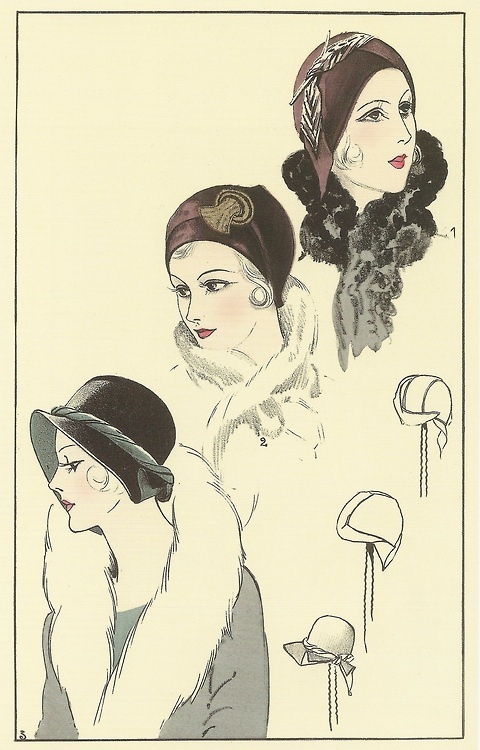 After all during the 1920s and 30s it would have been considered vulgar by most women, across classes, to leave the house without a hat. Whilst cloches are often thought synonymous with the 20s, they had already been popular before this point and were far from the only style of hat worn during this period. Many designers produced popular more flamboyant and exotic hats drawing on oriental influences, popular since the opening of Tutankamun’s tomb by Howard Carter in 1922, and Russian embroidery and styles brought to western Europe by those fleeing the 1917 Revolution. 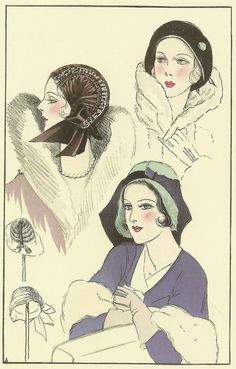 What was more consistent in the 1920s was the way in which hats were worn; deep or low over the head to frame the face, itself a canvas for the new trend in striking make-up. However, the trend for fuller more glamorous hairdos, demi-waves and perms in the 1930s saw hats softening, pushed back a little, and brims broadening. And of course, along with hats went matching gloves. Day dresses tended to be worn with short gloves and evening dresses with long gloves. In terms of colour, Paul Poiret set the trend reintroducing vivid colours in his collections in the 1920s and these stronger colours replaced Edwardian pastels. Colour was also used in bold blocks reflecting the influence of the cubists and fauvists on textile design and fashion during the 1920s. Drawing on these influences the Alconleigh hat uses deep stripes or blocks of myristica and myrtle separated by accents of Jonquil, a favourite of Poirets. It has a deep hemmed brim, and gentle folds achieved by changing needle size between the colourwork and plain sections. 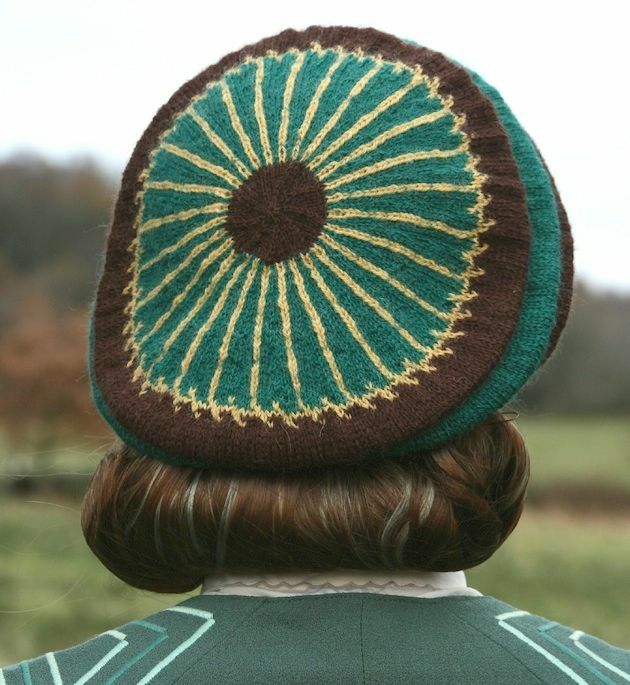 This is topped off by a striking colourwork crown which can be worn to the back or at a jaunty angle to the side. Alconleigh frames the face just as I hoped it would and this makes it a very flattering hat to wear. The gauntlets similarly have a hemmed cuff and folds along the forearm and can be worked pulled up of with gentle ruches. The colourwork on the hands reflect that on the crown of the hat. Alconleigh is named for the setting of much of Mitford’s 1945 novel, The Pursuit of Love, the first of the trilogy that includes Love in a Cold Climate and The Blessing. The novel begins with its narrator Fanny recalling childhood Christmases at Alconleigh. The fictional Alconleigh is largely based on Asthall Manor (link to Susan’s post) home of the Mitfords in the early 1920s. It does not receive the most sympathetic treatment in the novel, the house reflecting the character of its inhabitants, or perhaps its Lord, Uncle Matthew or Lord Alconleigh, a loud, crass, bullying, blood sports enthusiast. It would be tempting to suggest that he is a parody of a particular element of the aristocracy of the time, but actually he seems to be a rather close representation of Mitford’s own father and there are parallels with the Mitford family biography throughout the novel. 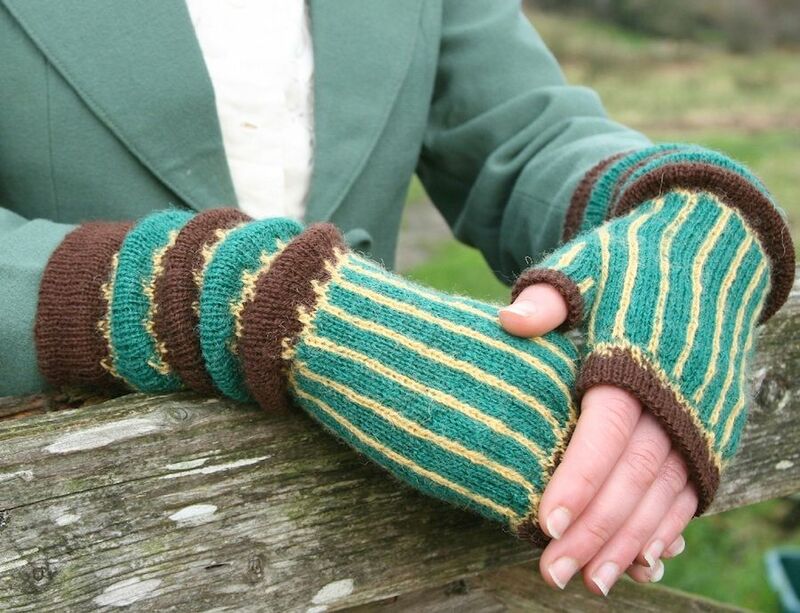 Alconleigh is described as both metaphorically and literally cold and a warm hat and gauntlets would be equally suitable for wear in both the house and across the estate! 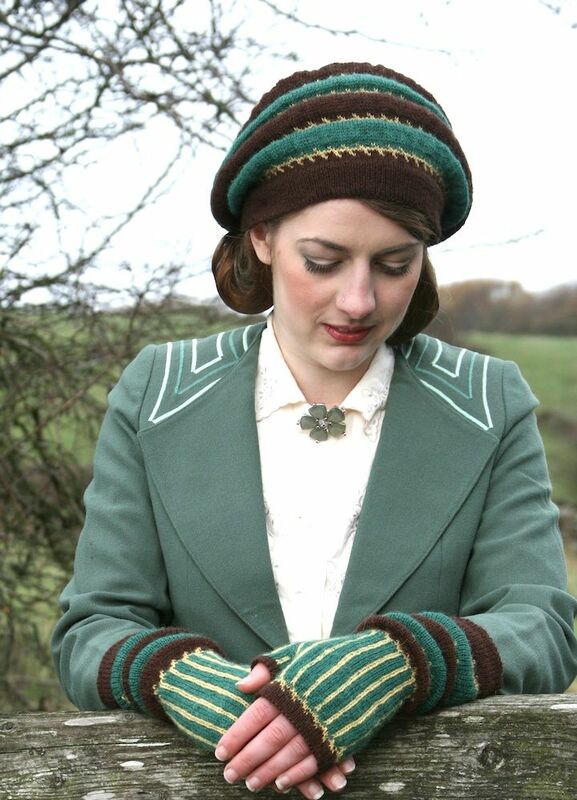 You can also purchase or take a look at all the possible colour combinations of Fenella in the shop here and a kit will also be available from the Susan Crawford Vintage shop .